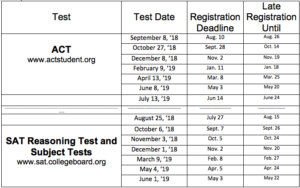 Seniors who will take the SAT or ACT should choose a date in the fall; Juniors should register for dates in the spring. Register online using the links below. Registration materials may also be picked up in the Guidance Office. Remember to look ahead to scheduled events such as retreats, theatre productions, and athletic participation before choosing a testing date. Students who qualify for free/reduced lunch, see Mrs. Nixon, College Counselor, for waivers of test fees. The CEEB code is used for SAT tests, ACT tests and some college applications. If you omit this code on your test registration, you will have to order and pay for a score report to be sent to BCHS. Read the test registration deadlines at this link.